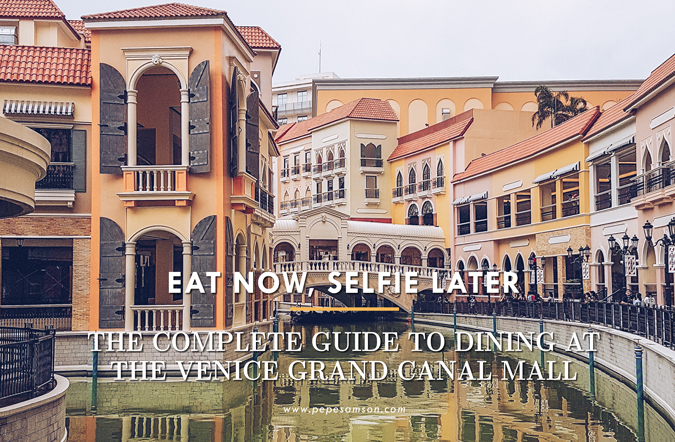 With the Venice Grand Canal Mall’s colorful facades, intricate details, and picture-perfect elements, it is no surprise that Filipinos flock the soon-to-be dining and shopping hub with their friends, families, and selfie sticks. As someone who works just right across the street, I have the tendency to take it for granted and even get slightly annoyed when the famous selfie bridge is full of visitors whipping out their cameras and blocking the way. 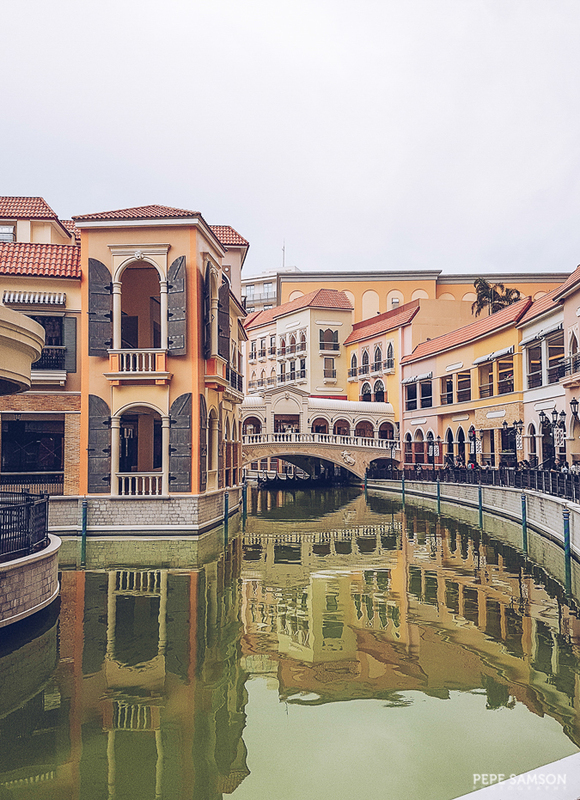 But looking at it from their point of view, the Grand Canal Mall is indeed a destination in itself—a beautiful replica of the Italian city known for its numerous canals, alleys, and gondolas. If I didn’t work in McKinley Hill, I would probably check it out myself too! 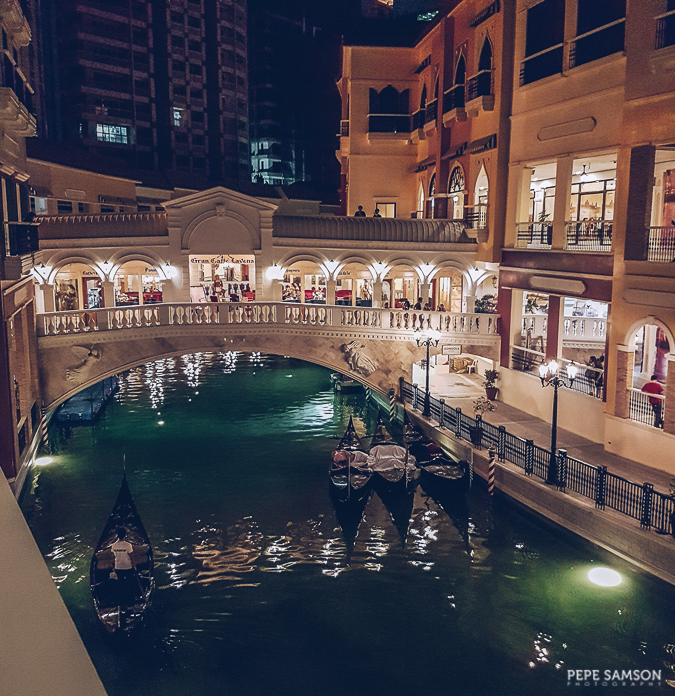 The canal itself is lined up with restaurants that truly evoke the feel of being somewhere far from Manila, with elaborate lamps, Italian-style columns, and sometimes even classical music pouring out of the invisible speakers. The ground level is designed such that Italian dining spots will be in the spotlight, and I, for one, am incredibly thrilled as I love this cuisine! 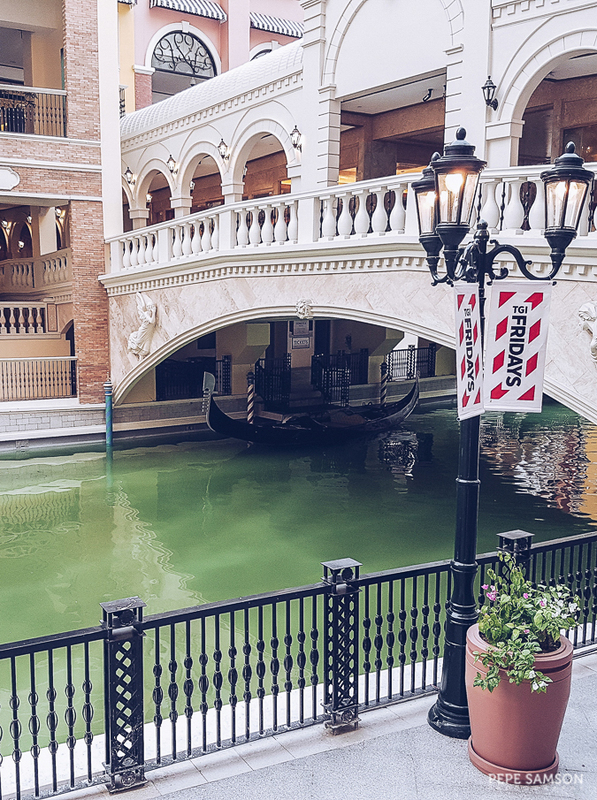 Check out the restaurants that have already opened and attracted loyal diners at the Venice Grand Canal Mall, and the list of soon-to-open places as well. I can’t wait until construction is finished and we can all see the mall in its full glory—and eat more food, course! As the name suggests, Toni & Sergio offers a combination of Italian and Spanish menus. The restaurant—both inside and in the alfresco area—is lovely. 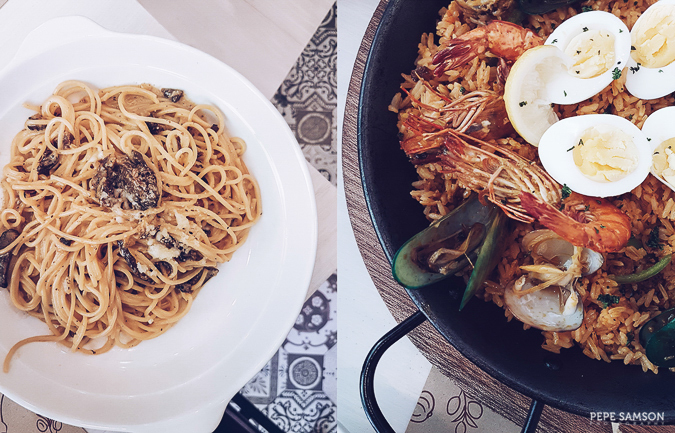 The food lineup was a bit of a hit-and-miss during the first weeks of operation, but there are solid offerings like the Porcini and Truffle Cream Pasta (PhP360) and the Paella de la Casa (PhP490), which is good for sharing. Both dishes are so good and are worthy of a repeat visit. 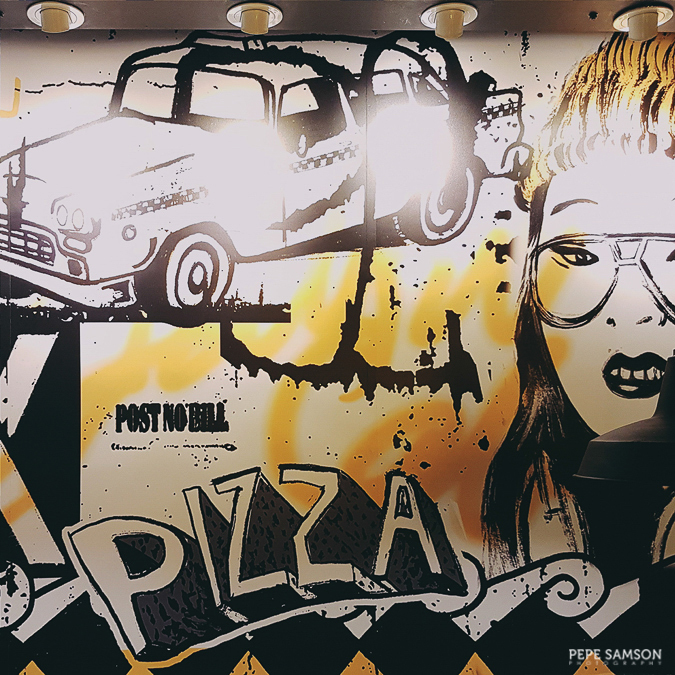 An instant favorite of mine, this Italian-Japanese restaurant specializes on sushi and pizza. 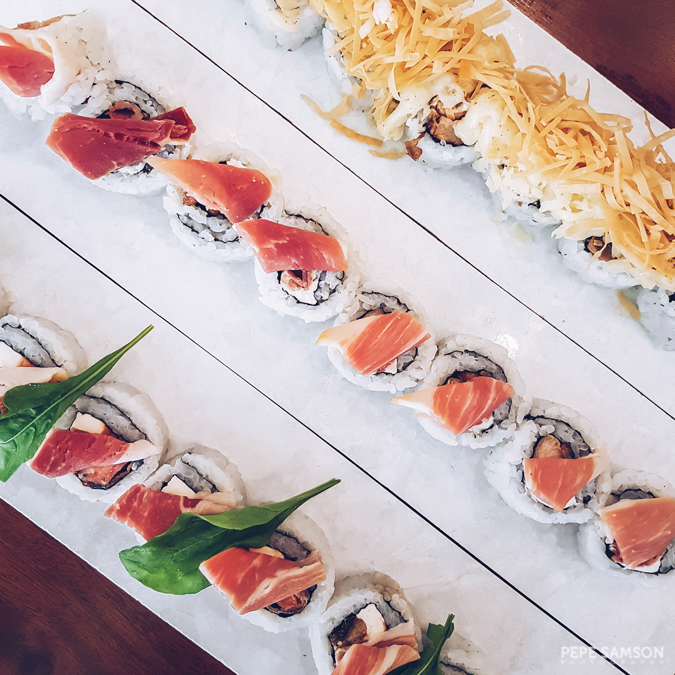 Owned by the same guys behind Torch, Rice & Dough has an impressive array of appetizers, salads, sushi, and pizzas, my recommendations being the following: Crispy Nori Chicken Wings, Quinoa Rocket Salad, Inception Roll, Truffled Bacon Cheeseburger Sushi, and Rich King Pizza. Try also their DIY option to create your own rolls and pies! 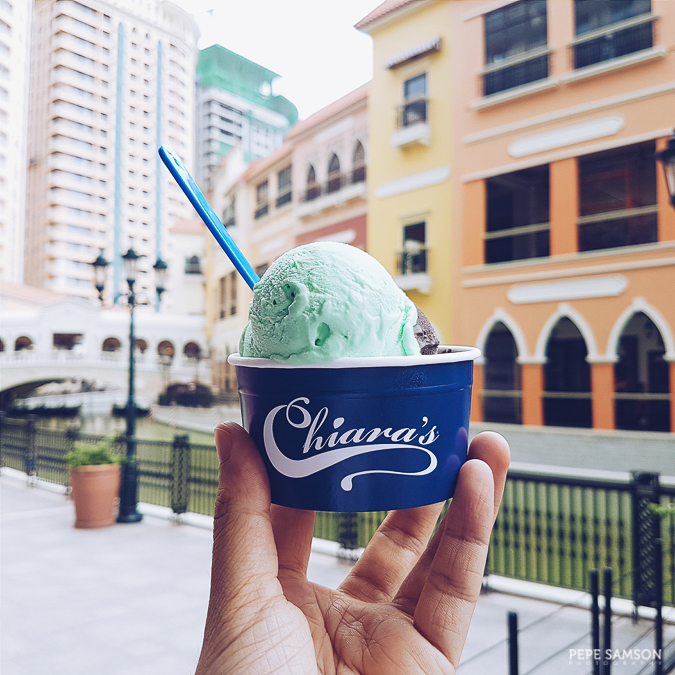 For an indulgent dessert fix, head over to Chiara’s gelateria and try their luscious gelato flavors. At PhP100/scoop or PhP120/3-flavor sampler, the gelato here is one of the best I’ve tried—rich and of balanced sweetness. Try the Dark Chocolate, Hazelnut, Pistachio, and Coffee: my top 4 favorites. A scoop or two is always perfect after a long day of taking selfies and dining in the other establishments. Hungry for European cuisine? Delicieux enters the scene with its menu composed of Spanish, Italian, and French cuisines. For someone who has grown tired of fast food, American food, or cafes, this restaurant is such a breath of fresh air. 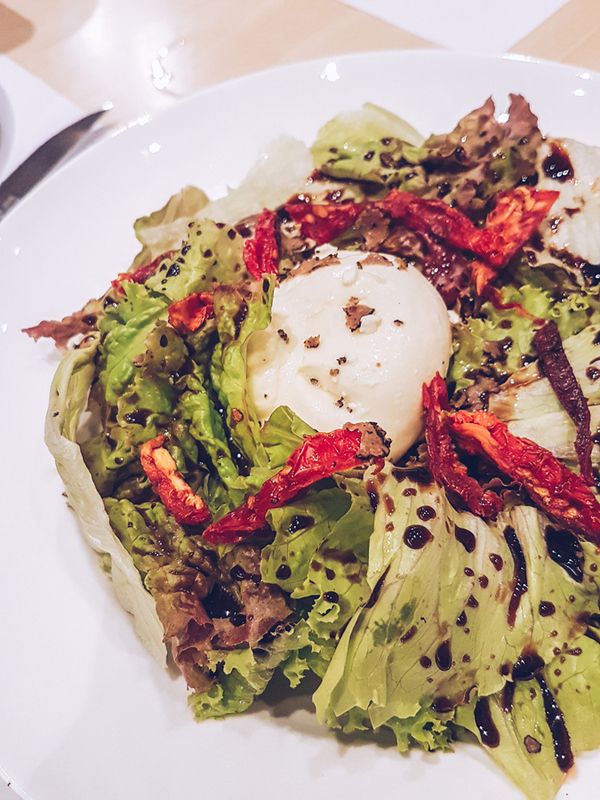 Try their burrata, which comes served with greens, sun-dried tomatoes, and truffle oil. Order a variety of entrees if you're all for sharing, or get a whole plate for yourself. 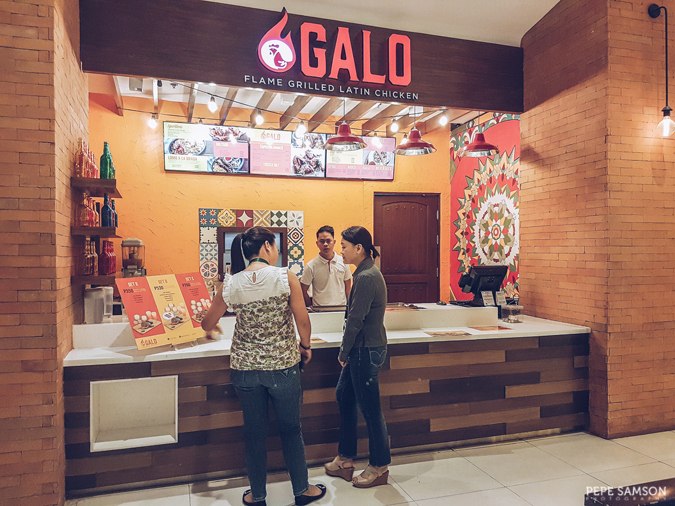 The owners of Mazza Shawarma have ventured further and introduced the McKinley Hill crowd to Galo—their take on Latin American cuisine. A plate of delicious chicken, fried rice, and a side dish will set you off at about PhP175, with your choice of sauce—like my weakness, chimichurri! It’s more expensive than the average fast food option but at Galo, food is prepared fresh and the chicken is indeed very tasty. Craving for finger-lickin’ good American food? 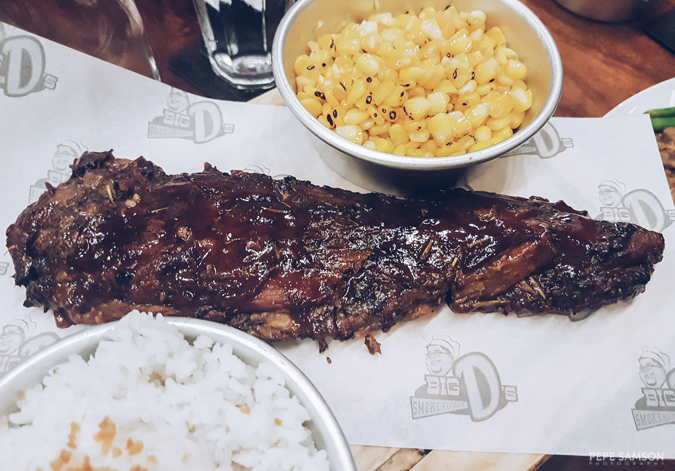 Head over to Big D's Smokehouse for some southern-style ribs done the right way! Get a full slab to share with friends or hoard a quarter slab for yourself! Paired with dirty or garlic rice, as well as some tasty sides, these meats are sure to deliver! Other must-tries include the Home Style Meatloaf made with 3 kinds of meats, Chicken Fried Steak with an addicting gravy, and Open-Faced Roast Beef served with perfect mashed potatoes. Hungry now? If you're looking a quick, cheap, yet satisfying, delicious, and even healthy meal, head over to Wok 2 Go and get one of their stir-fried takeaways. Choose your base broth from a fairly big selection, then specify whether you like it with white rice, red rice, noodles, or just vegetables. Feel free to add as many toppings as you want (each one charged separately)—there's chicken, pork, beef, and shrimp, and a whole lot of veggies such as mushrooms, broccoli, bell pepper, and many more. My favorites are the Gochujang, Pepper, and Rujak, and I usually have rice noodles or vegetables only, with extra chicken, broccoli, and mushrooms. Finally, a good Japanese place in Venice Grand Canal! 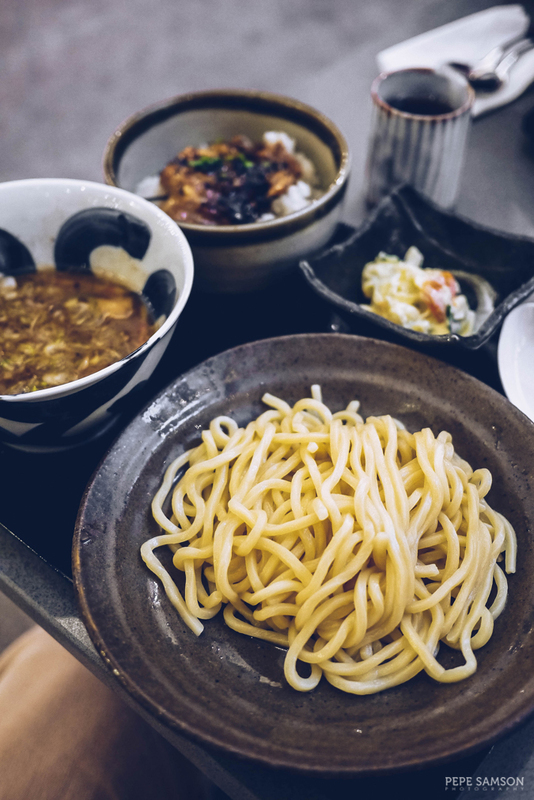 The House of Tsukemen has opened its doors to the public, enticing guests with reasonably-priced bowls of tsukemen, ramen, donburi, and many more! 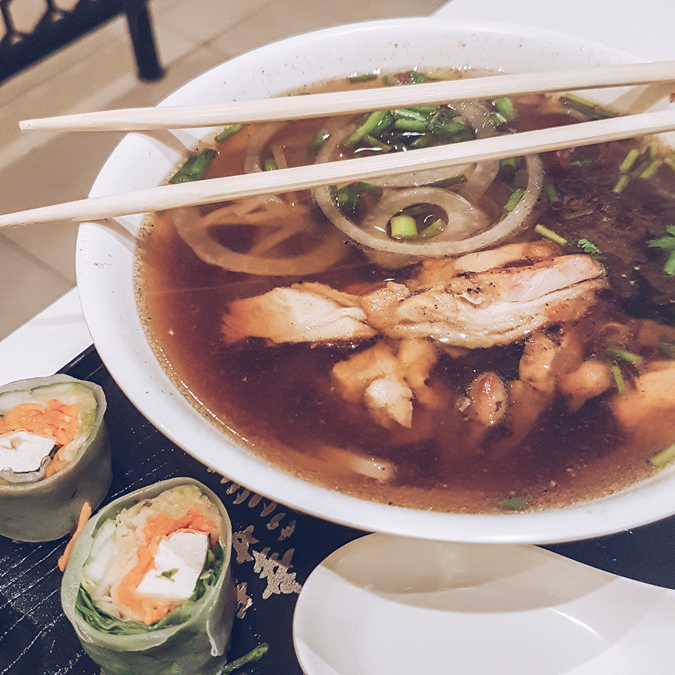 Order their set meals (PhP320 each) composed of a bowl of their signature Yuzu Tsukemen and a small rice meal of your choice (gyoza, black pepper chicken, katsu). Order their potato salad and spicy tuna as well! With a menu that seems to compile all the comfort food you can think of, Comfort Tuesdays promises a satisfying meal with your favorite dishes. Whether you’re craving for nachos, chicken wings, flatbreads, pasta, salad, or dessert, the restaurant has it. 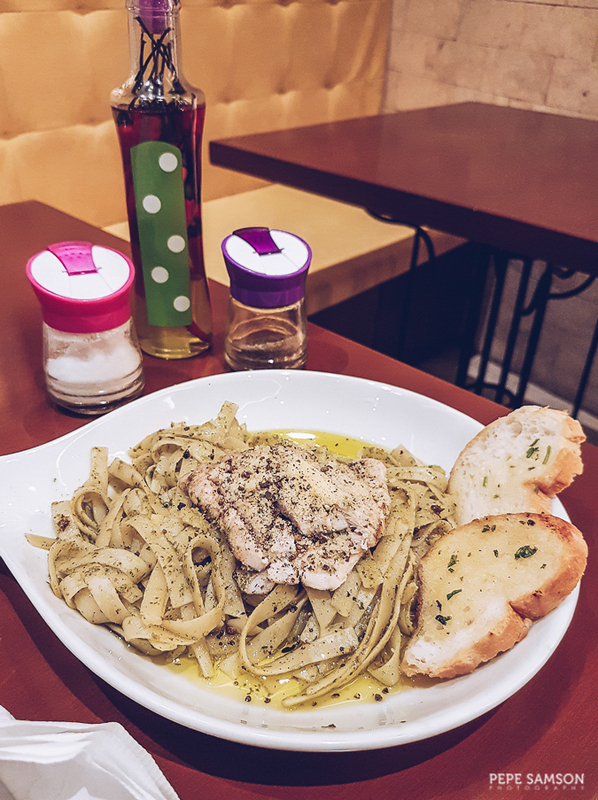 While I find most dishes overpriced for the quality, I would say that the Comfort Pesto (PhP225) or the Shrimp in Garlic and Olive Oil (PhP235) pasta deserve a try. They offer unlimited cocktails too. Love meatballs? Well, you can get your fix at The Meatball Revolution—a restaurant with the Italian staple as its central concept. Here, the meatball is reinvented in different forms: wedged in sandwiches, tossed atop pasta, or made into burgers. Accompanying the carnivore-friendly lineup are delicious starters like the Sweet Potato Jalapeno Puffs and Bang Bang Wings, as well as sweet treats like their ice cream sandwiches. Boasting of the best view in the entire mall, Gran Caffé Lavena sits on the other bridge way (Rialto) connecting the canal area to the piazza. Modeled after a famous café in St. Mark’s Square in Venice, the eccentric restaurant serves a full Italian menu, with special highlight on the pastries. It also offers fine wines, liquors, and cocktails. 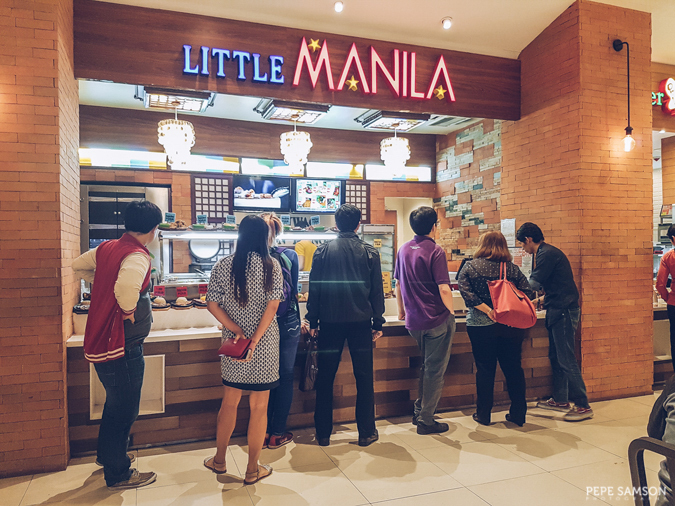 For yuppies working in McKinley Hill, Little Manila is a popular choice with its Filipino offerings. 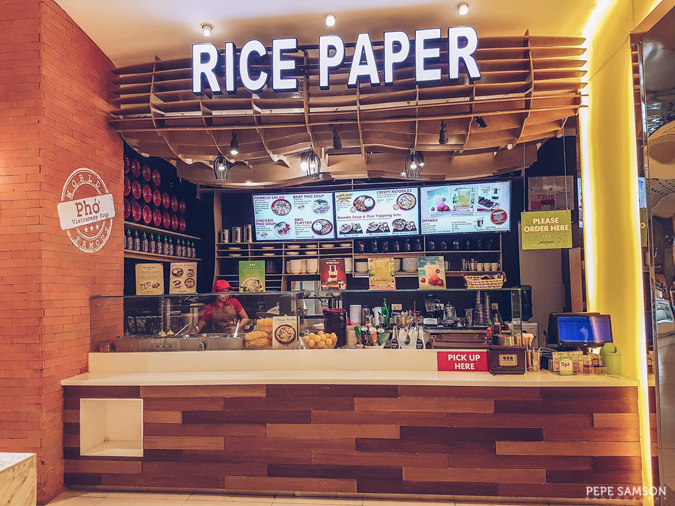 Operated by Baliwag Lechon Manok, this diner serves lunch sets that are no-miss, so whether it’s a smoky slab of liempo you’re craving for or a bowl of sinigang, you will find your hungry tummies satiated here. Another Italian restaurant along the canal, Ponte Rialto is a classy space that’s fit for business meetings, romantic dates, or special occasions. 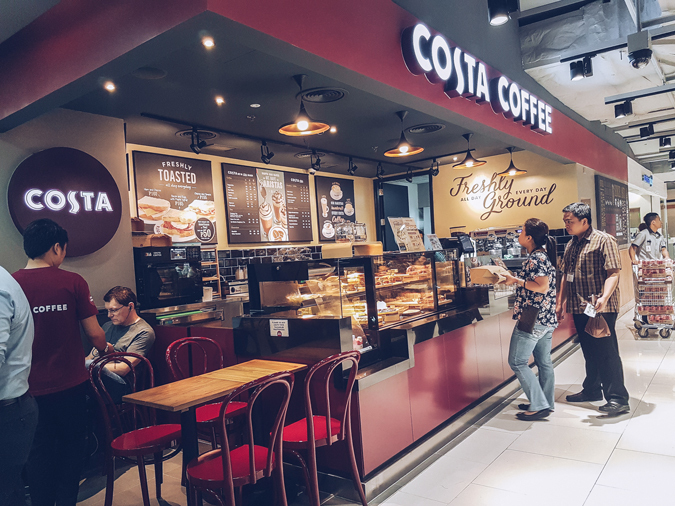 It offers an extensive menu of antipasti, salads, soups, pasta, pizzas, risottos, meat entrees, and desserts—alongside a selection of coffee, juices, cocktails, liquors, and spirits. If you’re simply more into the finer side of Italian dining, this is the place to be. A go-to place for after-work drinks or hefty American dinners, TGIFriday’s is a classic spot for mouthwatering burgers, ribs, and other sinful dishes. You can’t go wrong with their Chili Ball Park Nachos, Jack Daniel’s Sampler, Chipotle Yucatan Chicken Salad, and Creamy Pasta alla Vodka. 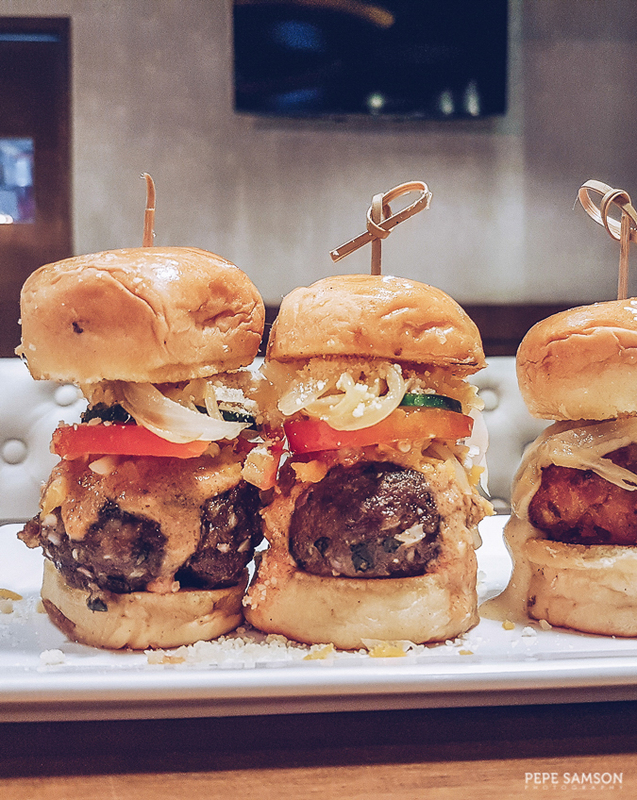 They offer draft beers as well as bottomless mojitos—plus a 50% off promo on their signature cocktails when you come before 7PM. Finally, affordable, delicious ramen! 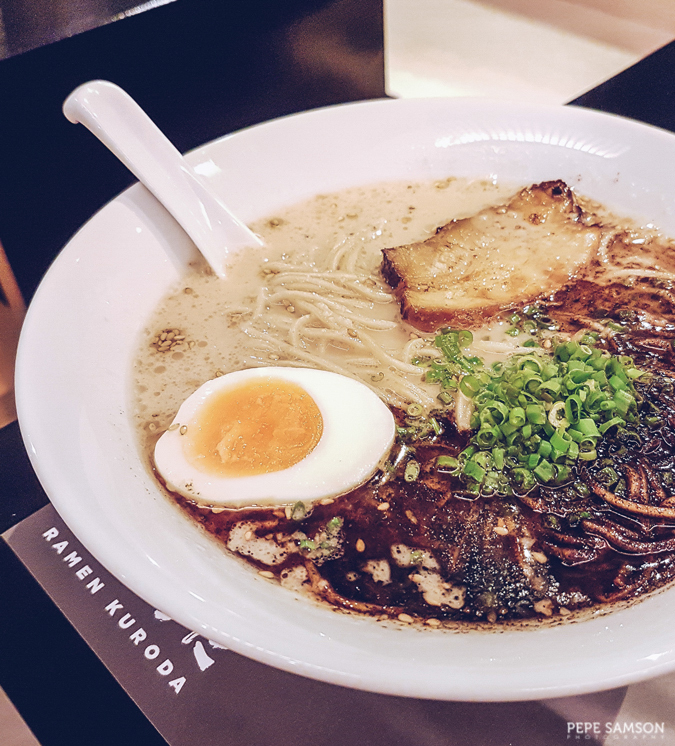 If you’re seeking a comforting bowl especially during rainy days, Ramen Kuroda will do the trick and provide you with hearty ramen. Try the Shiro Ramen which has the basic tonkotsu broth; the garlic-loaded Kuro Ramen; or the spicy Aka Ramen. Not bad for PhP180, but I wouldn’t say that it is one the best ramen places I’ve tried. 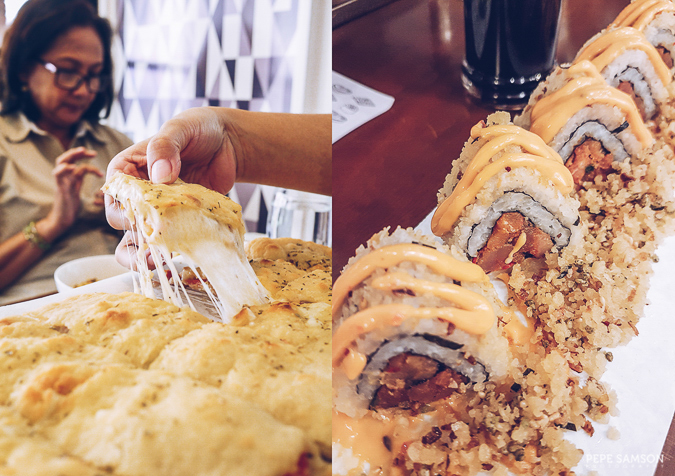 Order some extras like gyozas and their Teriyaki Pork Roll (PhP240). Have you dined in any of these restaurants? Which is your favorite?